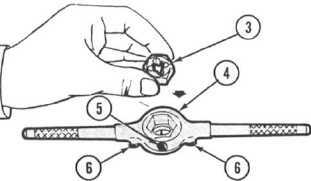 TM 9-243 USING A DIE AND DIESTOCK - Continued CAUTION After assembling die to diestock, make sure setscrew is tight. Die could fall out of diestock causing damage to die. 2 Assemble die (3) and diestock (4). 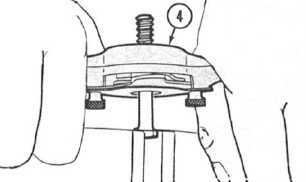 Tighten setscrew (5). 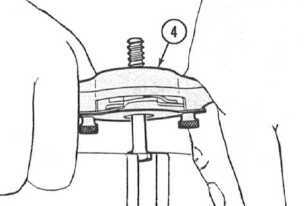 Loosen the two thumbscrews (6) to adjust diestock (4). 3 Apply cutting oil (7) to the die and to the work. 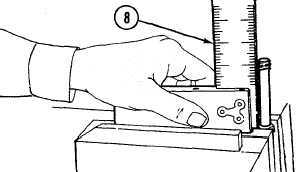 4 Position the diestock (4) over the work (1). 38-6 5 Tighten thumbscrews (6) securing diestock to work. 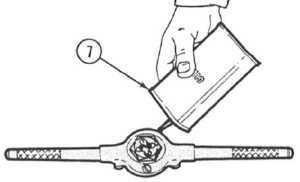 6 Rotate the diestock (4) clockwise, slowly but firmly, until the die takes hold. 7 Use square (8) to check squareness after several threads have been cut. 8 Turn the diestock (4) one turn forward and one-quarter turn backward. Repeat this procedure until desired thread length has been cut. 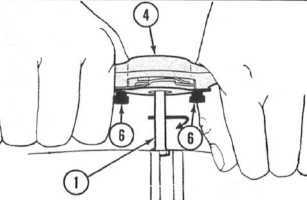 9 Carefully back the diestock (4) off the threads by turning in a counterclockwise direction.